Shahabi, S., Shafyei, A., Golozar, M. (2013). Evaluation of Heat Treatments and Their Effects on the Corrosion Behavior of TiAlON Coatings Prepared by Cathodic Arc Evaporation on D3 Tool Steel. International Journal of Iron & Steel Society of Iran, 10(1), 1-6. S. Shahabi; A. Shafyei; M. A. Golozar. "Evaluation of Heat Treatments and Their Effects on the Corrosion Behavior of TiAlON Coatings Prepared by Cathodic Arc Evaporation on D3 Tool Steel". 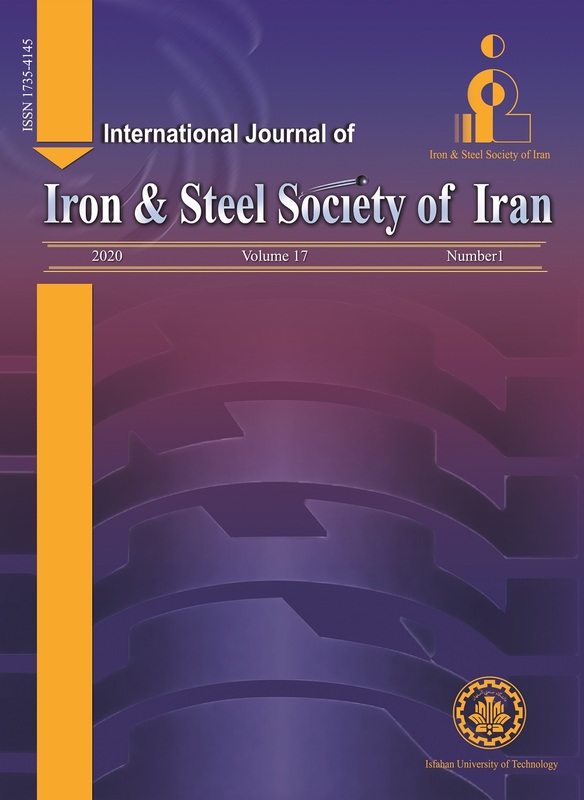 International Journal of Iron & Steel Society of Iran, 10, 1, 2013, 1-6. Shahabi, S., Shafyei, A., Golozar, M. (2013). 'Evaluation of Heat Treatments and Their Effects on the Corrosion Behavior of TiAlON Coatings Prepared by Cathodic Arc Evaporation on D3 Tool Steel', International Journal of Iron & Steel Society of Iran, 10(1), pp. 1-6. Shahabi, S., Shafyei, A., Golozar, M. Evaluation of Heat Treatments and Their Effects on the Corrosion Behavior of TiAlON Coatings Prepared by Cathodic Arc Evaporation on D3 Tool Steel. International Journal of Iron & Steel Society of Iran, 2013; 10(1): 1-6. A series of TiAlON coatings were synthesized in a gaseous mixture of argon, nitrogen and oxygen by cathodic arc evaporation method using a Ti–Al mosaic target. Oxidation of coatings was carried out by heating the coated samples at the temperatures of 500, 600, 700, and 800°C for 1 h in air atmosphere. It was found that heat treatment changed the microstructure and composition of the coating. The dark copper color of TiAlON films was also changed due to the heat treatment. The peak intensities of TiN were decreased and that of Fe was increased with an increase in heat treatment temperature. Furthermore, the amorphous Al2O3 in grain boundaries was transformed to a crystalline structure with increasing temperature. The variation in the chemical composition of the coatings was recognized to be a function of heat treatment temperature. The oxidizing treatment promoted not only the growth of titanium and aluminum oxides on the pore wall of the coating, thereby allowing a partial pore sealing, but also the inter diffusion processes which increased the coating internal cohesion. The structure of TiAlON coatings was studied using X-ray diffraction (XRD) and scanning electron microscopy (SEM). Morphological characteristics were analyzed by means of an Atomic Force Microscopy (AFM). Corrosion resistance tests carried out in the 3.5%wt NaCl solution showed reduced corrosion current density due to the oxidation treatment. This post-coating treatment could be effective in improving the corrosion protection of TiAlON coating on a D3 substrate. W. J. Chou, G.P. Yu and J. H. Huang: Corros. A. Kimura, H. Hasegawa, K. Yamada and TJ. Suzuki: Sci. Lett., 19(2000), 601. J. Vetter, HJ. Scholl and O. Knotek: Surf. Coat. I. Grimberg, VM. Zhitomirsky, RL. Boxman, S.
 L. Yan, Y. Dong, W. Zhao and G. Li: Int. J. Refract. Met. Hard. Mater., 25 (2007), 271. A. Hörling and L. Hultman: Surf. Coat. Technol. K. Tonshoff, B. Karpuschewski, A. Mohlfeld, T.
Surf. Coat. Technol., 108–109(1998), 535. C. H. Hsu, M. L. Chen and K.L. Lai: Mater. Sci. X.Z. Ding, X.T. Zeng, Y.C. Liu, L.R. Zhao and J.
Vac: J. Vac. Sci. Technol. A., 24(2006), 974. J.H. Huang: Surf. Coat. Technol., 111(1999), 16. L. Ji-Kwei: Thin Solid Films.,375 (2000), 123. S. Niyomsoan, W. Grant, D.L. Olson and B.
Mishra: Thin Solid Films., 415 (2002), 187. Jain and K.S. Rajam: Vacuum 77(2005), 169.